Life, as they say, is full of coincidences – Tarot pretty much “happened to me”. I lost someone very dear in an accident 15 years back. It sent me seeking – everywhere – anywhere – anyone would give me hope – I would go. Of course, the answers were neither quick nor easy to come. 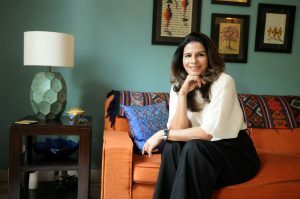 It has been an honor, and I consider it karmic when I started corresponding with Bernard Fitzwalter, whom I had found on the pages of Elle – India edition – 15 years back. In fact, he still writes for Elle – India. Bernard has twice been President of the Astrological Lodge of London, and for over 10 years, has been a tutor for the Faculty of Astrological Studies in London. I consider him my mentor and a big influence on me discovering Tarot. He has patiently led me through some of my darkest moments insisting each time he was, “just a magazine astrologer”. I owe him a lot. My love for Tarot started as me reading selectively for friends some years back. The number of times I began to be sought for the accuracy of my predictions made me go back to the books and study. It has taken me many years to be where I am today. I knew I had the intuition but years of working in the corporate world had taught me to be a skeptic and I rarely spoke about the *gift*. Coincidentally, my first tarot deck came as a gift from a friend some years back. From the time I shuffled the deck – the cards opened a beautiful world. It has been a lovely relationship since then, which grows better as years go by. I seek each day and enjoy meditation, writing about my experiences/leanings and reading energies of people across the globe. I am a certified reader from TCBA – USA and a western astrologer. I conduct personal readings via Phone and Skype with prior appointment (tarotbyanisha@gmail.com). I do not claim to know all the answers but I do know I have the ability to connect and read the energies of others, and help them have a little clarity. At the end of the day I believe we are all the masters of our own destiny and are responsible for our own life and actions. The only real teachers are life and yourself. I am just a reader.